There has been a surge of reports recently in Ireland about missed calls being received by Irish mobile phone users, who then ring back these numbers generating the missed calls and are then charged large amounts of money. 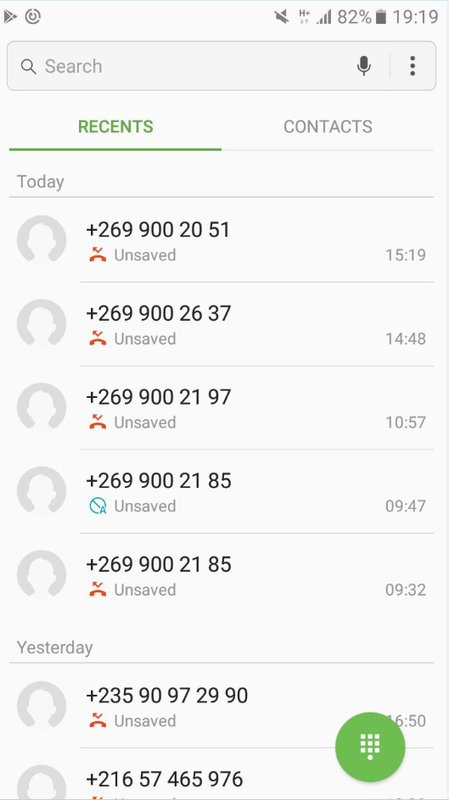 What is happening here is a form of mobile fraud called Wangiri, and the goal here is to social engineer/trick people into ringing back these numbers, causing their account to be deducted several euros at a time. the fraudsters will initiate thousands of calls, often to random target numbers. For a certain percentage of people, due to curiosity or habit, will see this missed call and dial it back, at this point they will be charged money for making this call (and staying on it) and the fraudsters will receive a % of this money. The originating number that will appear in the missed call is normally a number in a foreign country, and crucially, this is a Premium Rate Number (PRN) or some other high-cost number. A PRN is a number billed at a different rate to ordinary numbers, normally much higher, and this money comes directly from the victim who makes the call back to it. In these cases, the fraudsters have obtained (through legal or illegal means) ranges of Premium Rate Numbers in countries around the world, ensuring that they get a percentage cut of the money that accrues to these numbers when people dial them. One technical fact most don’t realise is that the calling number displayed – the Premium rate number - doesn’t actually mean that the phone ringing you is in that country. i.e. even though the number you receive says it is in Liberia (+231), this does not mean that a phone in Liberia is ringing you. In most cases the Fraudster will have connected to systems that allows them to dial remotely and set these PRN numbers as the dialling party. This allows the fraudster to cycle through different Premium Rate Number ‘ranges’ over time, and can make blocking after the fact quite difficult. There have already been a few incidents of Wangiri calls in Ireland in 2017, however, this latest attack over the last few days seems to have been of particularly high volumes. Basing it on our own experiences (AdaptiveMobile Ireland personal) up to 30% of Irish numbers could potentially have been affected. If this is repeated throughout the country it would be an enormous volume of call requests, and initial news reports do indicate that it was indeed at an unprecedented scale. had been reported in an earlier ‘wave’. This use of multiple country ranges over time is to be expected. As explained earlier, it’s not that the Wangiri calls are actually coming from these countries, but that ranges from these countries are being used. Fraudsters performing Wangiri attacks will normally have many PRN ranges they can swap and cycle through to execute the attack, and the attacks will continue for as long as the Fraudsters believe they can make money. On that point, it’s too early to judge the success rate for these attacks. But within the telecom fraud industry, call back rates for Wangiri can potentially be surprisingly high – an ‘effective’ attack can be up to between 10 to 15%. Even assuming a lower call back rate of 1% - based on the potential volume - the impact to Irish mobile phone user of tens of thousands of calls each being charged several euro over the course of a few days can quickly add up over time. As additional counter-measure if you are getting really hassled with incoming calls would be to block numbers or number ranges on your handset. However, for this you may always be playing ‘catch-up’ as the fraudster use new numbers and ranges. 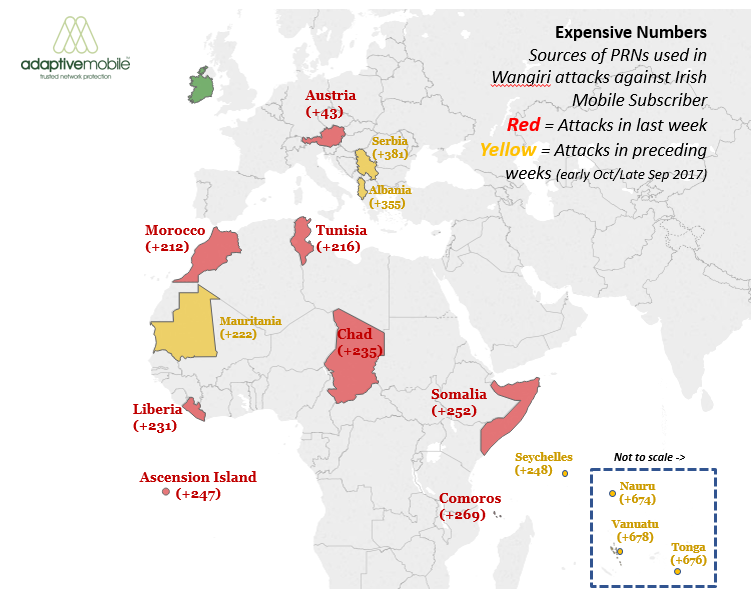 Ireland certainly isn’t alone in being targeted by this scam, Wangiri is a common phenomenon and there are many examples of equivalent attacks in other countries now and in the past. Sometimes the fraudsters make unique modifications that are performed to improve the call back rate but in general the pattern is quite similar since those first attacks in Japan 15 years ago. In the short-term Irish mobile phone users will have to stay vigilant, and if in doubt when receiving a call, don’t answer.